Today, 29 March 2006, the Moon's shadow swept over the Earth during the 4th total solar eclipse of this century. The path of totality began in south America, crossed the Atlantic to Africa, where it travelled over the northern part of the continent. It went on to cross the Mediterranean Sea to Turkey, after which it passed through central Asia to end in Mongolia. A team of students and coordinators from the Observatoire de Paris observed the eclipse from Benin in west Africa. At the observing location in Savalou, Benin, maximum totality occured at 9:18:27 UT. 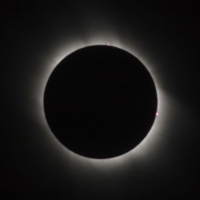 The image on the right was taken during totality with the solar corona clearly visible. Credit: Jay M. Pasachoff/Williams College Eclipse Expedition. The Greek island Megisti (also known as Kastellorizo) is in the south Aegean Sea, close to the coast of Turkey. The Williams College Eclipse Expedition group under supervision of Jay M. Pasachoff observed the total eclipse from there and performed several experiments dedicated to imaging the Sun's corona. 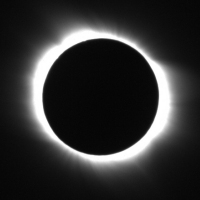 Support observations were made by SOHO at the same time to compare the space based and ground based images of the Sun at the time of totality (See related link "Ground-based/SOHO view of the Eclipse"). At Megisti, totality occured around 10:53 UT and lasted for 3 minutes, during which time this picture was taken.